I had joined a swap for a famous place thinking I had the perfect Eiffel Tower image to use. I couldn't find that darn thing anywhere so I used this one of the Twin Towers. I layered red, white and blue papers and used my Palette L'Amore Red Ink to edge the paper with. I also used a little bit of colored pencil for the water at the base of the image. Then I mounted it onto ...ummm what is it called? that sticky grid paper....grrr can't think of it now..anyway I stuck the image onto it but I added a glue dot to the back of each end of the image for a little extra holding power. I then affixed the metal letters from Eyelet Outlet "USA" with bright red brads. 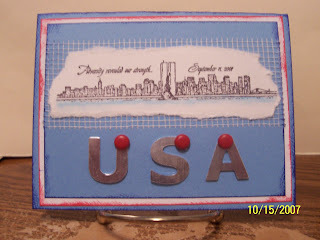 This was a quick card to put together but still whenever I see or hear about the Twin Towers I am sad. Look what scraps can make!